With the trade deadline behind us, the end of the regular season is closer than it may seem. The races for division leads and Wild-Card spots will heat up a lot in the next few weeks. The run the Los Angeles Dodgers are on right now deserves some special notice. The Dodgers were 22-18 after 40 games. There was some talk about it being a disappointing start to the season. How have things gone since? The Dodgers have proceeded to go a mind-boggling 63-16 in their last 79 games. It's not often you see runs like that in Major League Baseball. Doc's Sports has done an MLB Totals Trends Report in the past, and we'll be doing it again this year. This will be a bi-weekly article here on the site. We'll highlight the Top Five 'Over' and the Top Five 'Under' teams of the past couple weeks in each article. Because the baseball season is a long grind, there can be some impressive streaks inside the season, and catching one of these can boost your bankroll. The statistics in this article are for games from July 28 through Aug. 16. 1. 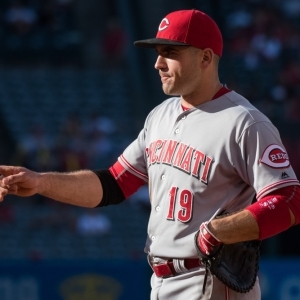 Cincinnati Reds (14-5) The Cincinnati Reds have been an underrated offense all year. It doesn't hurt to have one of the top three or four hitters in the game in Joey Votto right in the middle of the order absolutely smashing the baseball. Additionally, Zack Cozart is having a breakout season for the Reds. Cincinnati is sixth in the majors in weighted on base average. The Reds also have a terrible pitching staff. The overs will probably keep coming. 2. Detroit Tigers (13-7) It doesn't surprise me a bit to see the Tigers here. Detroit has the worst bullpen in baseball. That bullpen on its own can allow some epic blowups late in the game to push the total over. Detroit got rid of J.D. Martinez, but they still have a very solid group of hitters at the top of their order. Look for Tigers totals to be very high from here on out. I still wouldn't want the under, though. 3. Oakland Athletics (11-6) Oakland has allowed six runs or more in eight of their last 10 games. That's some awful pitching numbers, and it will likely continue, though not to this extreme. The A's traded away some key bullpen guys, and they are now very weak in the bullpen. The starting rotation was never any good. Oakland's offense is much better against right-handed pitching, so I'd look to play overs when they are up against mediocre righties. 4. Seattle Mariners (11-7-1) Seattle is down to 61-61. The Mariners had a nice hold on a playoff spot recently, but they have fallen apart. Seattle's starting rotation is most to blame. The Mariners have received only 45 quality starts all season. Injuries to their rotation have left them really thin. James Paxton is out for at least two more weeks (probably more), and that is a huge blow to this team's chances. 5. Kansas City Royals (11-8) There seems to be no real rhyme or reason to it, but the Kansas City Royals continue to go on epic slumps and hot streaks as an offense. This is a team that might score a grand total of two or three runs in an entire series, and then turn around and score 40 runs in a four-game period after that. I like to avoid betting totals on teams like this. Which offense will show up? It's hard to predict. 1. Tampa Bay Rays (14-4) Here's an ice-cold offense. In their last 16 games, the Rays have a weighted on base average of just .271. That is easily the worst in all of baseball. Tampa Bay was among the top five in the majors against right-handed pitching most of the year, but this epic slump has taken them all the way down to the bottom half of the league. The Rays were never as good as their offense looked earlier this year, but they also aren't this bad. I think they'll meet in the middle soon. 2. Colorado Rockies (12-5) It's a surprise to see Colorado here. Late-season Coors Field overs have typically done very well. It should be noted that eight of the games from this time period were on the road, and six of them stayed under. Still, the Coors Field overs haven't been cashing as often lately. It is partially due to the oddsmakers throwing out totals of 12 with a lot more consistency. Keep a close eye on the weather here. The over should have value again in games where the weather is warmer at Coors Field. 3. Cleveland Indians (11-4) Above I mentioned that the Rays were easily the worst in baseball in weighted on base average in the last couple weeks. Who is second worst? It is these Cleveland Indians. This offense has definitely been a disappointment this year. I still believe this unit is better than they have shown, though, and the totals have gotten very low for the Indians. It might be time to be cautious here. 4. Milwaukee Brewers (11-5-2) The Brewers are fortunate that the Cubs have cooled off again, because Milwaukee hasn't been playing well. A lot of their youngsters that were red hot earlier in the season have been struggling of late. Milwaukee is relying too much on the home run ball right now. They need to be able to string together some walks and hits to manufacture runs more often. 5. Baltimore Orioles (13-7) Baltimore's recent under run comes as their bullpen got healthy again. Zach Britton being healthy at the back end of this bullpen makes a world of difference. Baltimore's long relief is their weakness, but if they can get starters through six innings or more then they are in good shape. The Angels and Athletics visit Baltimore this weekend and early next week. These are games that Baltimore needs to win if they want to significantly improve their chances at being in the playoff hunt. Doc's Sports is offering $60 worth of member MLB picks absolutely free - no obligation, no sales people, no credit card information. You can use this $60 credit any way you please on any of our top MLB handicappers. Get your free baseball picks now . Also, for a limited time only get three MLB handicappers for the price of one. Click here for details . Get free baseball picks today at Doc's Sports baseball predictions page .